Product prices and availability are accurate as of 2019-04-03 07:02:50 EDT and are subject to change. Any price and availability information displayed on http://www.amazon.com/ at the time of purchase will apply to the purchase of this product. Comes with 20 of the Smooth LED G40 Warm White Bulbs (0.49 watts each). Bulb size: 1.5" diameter and 2.25" high (with base). Average bulb life: 50,000 hours. Color temperature: 2700K. Warm White is similar to regular incandescent bulbs. 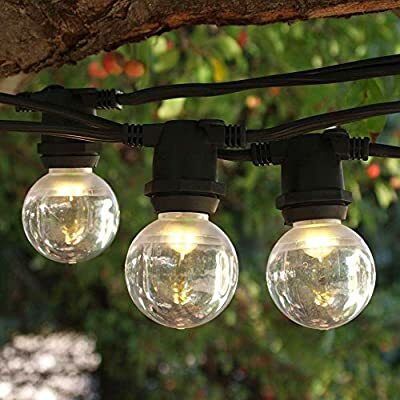 Bulbs are non-dimmable.Made of weather-resistant, break-resistant durable plastic. 15" spacing between sockets. 20 sockets per cord. One foot lead and tail wire.End-to-end connection. Max run is 1200 watts. You can plug 122 strands together using Smooth LED G40 (0.49 watt) bulbs. If one bulb burns out, the rest stay lit. Manufactured with 16-gauge wire and high-quality sockets. PVC socket forms a tight weatherproof seal around the bulb. Indoor or outdoor use. Suitable for permanent, outdoor installation. You must keep a bulb in every socket to maintain weatherproof quality.Assembly required. Bulbs will need to be screwed in. Comes with 20 of the Smooth LED G40 Warm White Bulbs (0.49 watts each). Bulb size: 1.5" diameter and 2.25" high (with base). Average bulb life: 50,000 hours. Color temperature: 2700K. Warm White is similar to regular incandescent bulbs. Bulbs are non-dimmable. Made of weather-resistant, break-resistant durable plastic. 15" spacing between sockets. 20 sockets per cord. One foot lead and tail wire.